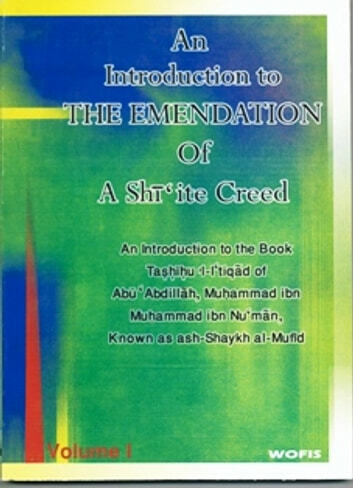 Praise be to Allãh through Whom we have succeeded in publishing Tashīhu 'l-i‘tiqãd ["The Emendation of A Shī‘ite Creed"] by the Shaykh al-Mufīd, after having succeeded, through Him, in publishing I‘tiqãdãtu 'l-Imãmiyyah ["A Shī‘ite Creed"] by the Shaykh as-Sadūq, may Allãh be pleased with both of them and with all those who work for the spread of Islam and in the service of Muslims. The English translation of Tashīhu 'l-i‘tiqãd has been with us for some time, the translator having prepared it as part of his university thesis which consisted of three parts: a biography of al-Mufīd, the translation of the text of the book, and a section of commentary and notes which the translator attached to the sections of the book. Since the contents of this final section were somewhat inconsistent and not in keeping with the aims we have set ourselves in our work, nor with the standards we have set for our publications, we have been content to print only the first two parts. However, one of our colleagues has written a preface to the book, which redresses the errors, which were responsible for the shortcomings of the third section, and we have included this as an introduction to the text.